Sometimes you might want to use Bookwhen to help you schedule appointments. If your appointments are only spanning a few days, please follow the steps in option A. If your appointments span weeks or months then please follow the steps in option B. Create or Edit an existing entry (from the Schedule tab at the top of your screen). Click on Dates & Times on the left. Select your Start date and Start time e.g. 11:00am Monday. 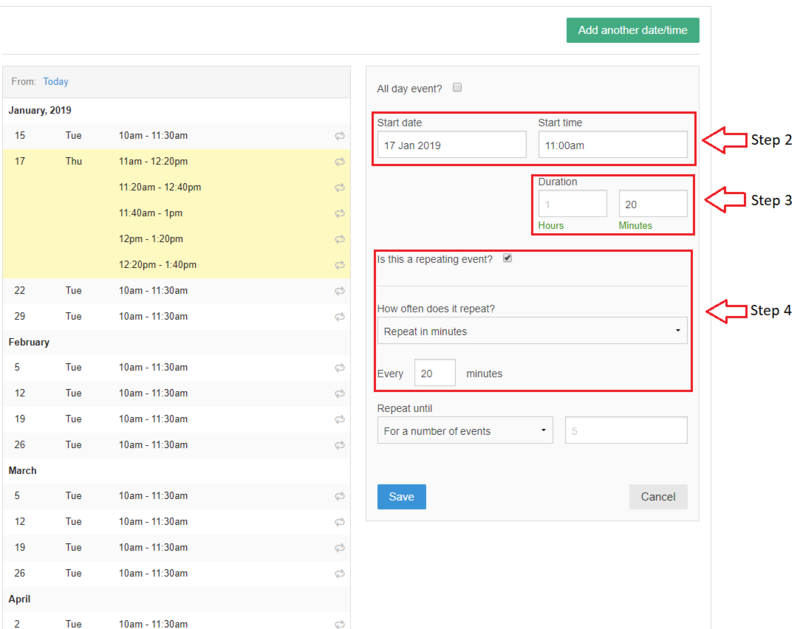 Now change your event Duration to the length of each appointment (e.g. 20 minutes). Click the option for repeating event in hours or minutes, then select to repeat using a time duration the same length as the appointment in step 3 - 20 minutes in this case. It could be longer if you want breaks in between! Then select the number of events to repeat from your start time and click to Save. In the Tickets & costs section make sure you've set the Maximum attendees to the required amount (1 person per appointment, for example). You have your first set of appointments! Selecting any of your newly created appointments gives you some options to change the whole set, delete individual appointments (handy for gaps in your day), or to remove from your schedule all together. To create another day of appointments, just click on the green Add another date/time button and repeat steps 1 - 6 (Option A). As always, please make sure you save your changes at the end. If your appointments span weeks, it's more efficient to add them in as repeating times across multiple days. Click on Dates & Times on the left. Select your Start date and Start time. Click Is this a repeating event? then select the option for Repeat daily or Repeat weekly. Repeat weekly gives you options to select specific days on which to repeat the appointment. You now have your first repeating appointment! It might, for example, be a 20 minute appointment repeated at 11:00 Monday - Friday for 3 weeks. Selecting any of your newly created appointments gives you some options to change the whole set, delete individual appointments (handy for specific dates off), or to remove from your schedule all together. If you have multiple appointments each day, then simple follow steps 1-6 (Option B) with your next appointment. Make sure the start time isn't earlier than your last scheduled appointment. E.g. in this case, starting no earlier than 11:20.